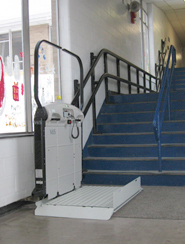 INCLINED PLATFORM LIFTS: This type of lift is used to transport mobility-impaired people, including their wheelchairs, along a flight of stairs and are designed for both residential and commercial use. In public buildings, these lifts are also fitted with folding seats and seatbelts for non-wheelchair users. Some models are capable of turning corners and can serve multiple levels. 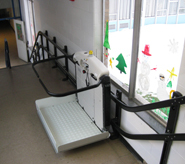 Compact folding platforms leave the stairway virtually unobstructed when not in use. Manual and power-folding platforms and safety barrier arms are available. Power operation must be specified to comply with the reach range requirements of ADA. Models are available for use both indoors and outdoors.